Maker Faire Detroit was a two-day festival with creations from hundreds inventors, innovators and hackers. From a grassroots effort, Maker Faire has grown to a massive event, 19500 people in attendance, where the public can gather to connect with other educators, tinkerers, hobbyists, exhibitors, and thousands of other makers inspiring the next generation of makers and innovators. As part of Hitachi’s Global initiative Maker Faire Detroit’s booth was a massive collaboration between many different Hitachi Group Companies. 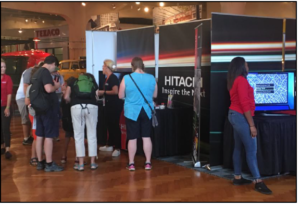 Inspire STEM Educations collaboration centered on connecting with local students, teachers and STEM Ed program coordinators to share Hitachi’s nanoscience education program, currently housed at The Henry Ford Museum and who will be starting school outreaches this 2018-19 school year. The Henry Ford museum, as an Inspire STEM education partner, was also in site with their booth and showcased the SEM by viewing real historical artifacts and showcased their new educational programming for visitors. Lori Harvey, STEM Educational Outreach and CSR Programs Manager, was also invited to moderate an all women panel to inspire girls to pursue STEM careers by having a chance listening and ask questions to women who are pursuing a career in STEM and are working in STEM currently.